An interesting article from The New York Times. Shannon Des Roches RosaLeo Rosa, son of Shannon Des Roches Rosa, of Redwood City, Calif., plays with Spot the Dot, an educational app for the iPad. The Apple iPad has been hailed as a savior for assisting children with autism spectrum disorder or other special needs. It was portrayed as a minor miracle in a recent segment on “60 Minutes” and has been found to help even the very young quickly learn. Anecdotally, teachers, parents and therapistsdescribe the profound difference that apps for Apple and Android products have made in helping autistic children develop skills. IPad programs have provided a means of communicating for some children with autism who cannot speak or have language delays. Other apps help children learn to handle social situations that can be stressful, like crowds at malls. And many programs can help develop fine-motor skills, which promote functions like writing or manipulating small objects. Sami Rahman of Houston said that his son, Noah, 3, who has cerebral palsy, was woefully behind in fine-motor skills, speech and cognitive skills before he began therapies and intervention programs. But in four months, the apps he used — along with sessions with therapists and teachers — have put him ahead of the curve in all these areas, Mr. Rahman said. But as is the case with so many categories of apps, it’s daunting to know where to begin when sorting through the thousands of programs available. “There are so many apps, and not all of them are great,” said Shannon Des Roches Rosa of Redwood City, Calif., whose son, Leo, 11, has autism. iPad Apps for Autism A Google docs site maintained by Ms. Rosa that grew out of a project she did for the Hollyrod Foundation. The apps she has reviewed and recommended are classified into categories like art, language and music. Jordan Sadler, a professional speech therapist in Chicago, and Corina Becker, an adult with autism, are among the main reviewers. Among the developers she recommends are Injini, Toca Boca, Duck Duck Moose andOceanhouse Media. “Specific companies produce great apps,” Ms. Rosa said. Other sites she recommends for app listings include Technology in (Spl) Education, which includes a list of free and discounted apps, and Speech-Language Pathology Sharing for language development. a4cwsn.com This site, which stands for Apps for Children With Special Needs, features 500 video reviews done by Gary James of Oxford, Conn., who has a son with autism and a daughter with epilepsy. He says he has reviewed some 5,000 apps, but only lists reviews of apps that he believes do what they promise. If an app passes that test and is listed, developers can pay to be on the home page of his site. But that revenue does not cover all the costs of operating the site, he said. 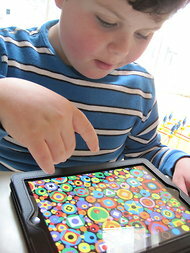 iAutism.info This database contains over 400 apps for iPad/iPhone and nearly 70 for Android. The site was started by Francesc Sistach and his wife, Susana Vila, who live in Spain. Iván Soriano, another parent of a child with autism, is also a main reviewer. Mr. Sistach says the app he finds most interesting is See.Touch.Learn, an app based on Applied Behavior Analysis, a common early intervention therapy for autistic children. “This app can complement expensive one-to-one sessions with a therapist with self-learning sessions using a tablet,” he said.